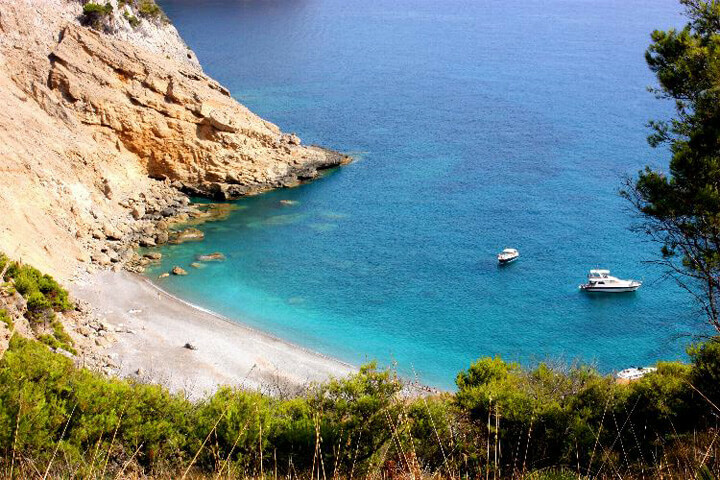 The Coll Baix is one of the most special beaches of Mallorca. Inaccessible by land, from the sea you will access to a pristine beach surrounded by high vertical walls of stone. Its waters are turquoise. A few meters from the shore, which makes it a good place to anchor. This beach of gravel and coarse sand color is a broad and straight sea inlet, flanked by impressive rocky cliffs and closed by a rampart of considerable height.This environment is guarded to 445 meters by a defensive tower of the sixteenth century, sa Talaia d'Alcúdia, dominating the bays of Alcudia and Pollensa.